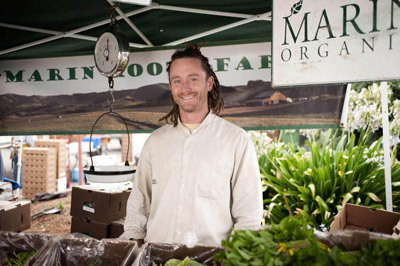 Almost 10 years and many lessons later, Marin Roots is a well-established organic specialty produce business. “It’s a lot of people’s dream to live off the land, but the reality of it is, you have to have a plan for how you’re going to pay the bills,” says Kuhn. His journey is not unlike that of many beginners who are eager to try their hand at farming but don’t yet have all the necessary skills and resources. 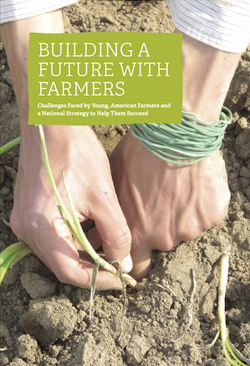 In a recent report titled Building a Future with Farmers, the National Young Farmers’ Coalition (NYFC) surveyed 1,000 young and beginning farmers across the US and found that access to land, capital, health care, credit, and business training posed huge challenges. Kuhn’s path to farming started as a child in San Geronimo, where he had little exposure to agriculture but picked up a passion for gardening from his grandmother. “She had two green thumbs for sure, and I learned from that,” says Kuhn. When he went to Humboldt State, he joined their new agriculture program and studied permaculture on the side. He also took time off from school to work at an organic soil company and contemplate career paths. After college he started farming a small one-acre plot, using the model he’d learned on the student farm, but realized the operation was more like a hobby farm than a viable business. So he worked as a landscaper while farming small plots in friends’ backyards, which eventually helped him build the courage to take the leap into full-time farming. He took out a “land wanted” ad in the Press Democrat and, after receiving a number of responses, settled on a 15-acre agricultural plot on a goat dairy ranch near Petaluma. But there were setbacks infrastructure-wise, such as having to install a new irrigation system, and Kuhn began charging up his credit cards. Right when he was about to declare bankruptcy, a low-interest beginning farmer loan through the USDA Farm Service Agency came through. He was able to buy a tractor, a delivery truck, and seeds. Through much experimentation, Kuhn found his niche growing organic specialty crops such as baby greens, roots, beans, and summer squash for farmers markets and grocery stores, restaurants, and wholesalers. “A lot of the products I was selling weren’t standardized because I was doing open-pollinated varieties, but there was certainly a market for that,” he says. He now employs a handful of full-time market and field staff. The NYFC study underscores the viability of direct marketing as a start-up strategy for new farmers, with 61 percent of their respondents selling at farmers markets and 49 percent through CSAs. “Helping young farmers means reorienting our food systems so that we’re not just supporting producers who are growing commodity crops and abandoning the small- and medium-scale producers who are more than likely selling directly to the marketplace,” says Fleming. For aspiring greenhorns, Kuhn recommends getting a job or volunteering on a farm in order to get to know the business. When taking the plunge into starting your own farm, he emphasizes finding the right piece of land, with infrastructure already in place, and developing a niche. Jesse Kuhn photo by Gary Yost (www.garyyost.com). 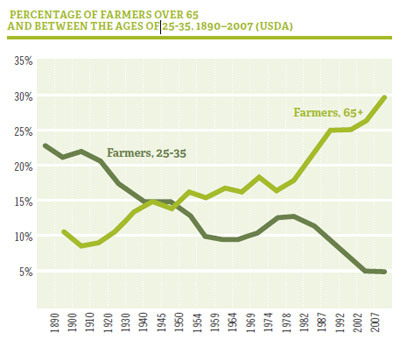 Chart by the National Young Farmers Coalition.